WASHINGTON (AP) — With a new deadline approaching, Democrats in Congress are struggling to adopt a unified strategy to protect hundreds of thousands of young immigrants from deportation. Democrats’ inaction has enraged liberal activists, who have shifted their anger away from the Republicans who run Congress. Democrats are trying to balance their commitment to a progressive priority with their desire to avoid a government shutdown — and the potential fallout in the 2018 elections. Groups such as MoveOn are threatening to champion primary challenges against incumbents who don’t fight hard enough for these young immigrants. They’re commonly referred to as “Dreamers,” based on never-passed proposals in Congress called the DREAM Act. The liberal organization CREDO is pledging to block campaign cash from uncooperative Democrats. The pro-immigration United We Dream is preparing a new wave of camera-friendly protests at the Capitol and outside congressional Democrats’ offices nationwide. “The unity and trust between the grassroots and elected Democrats is rapidly eroding. It could turn ugly if this goes on any further,” said Ben Wikler, MoveOn’s Washington director. 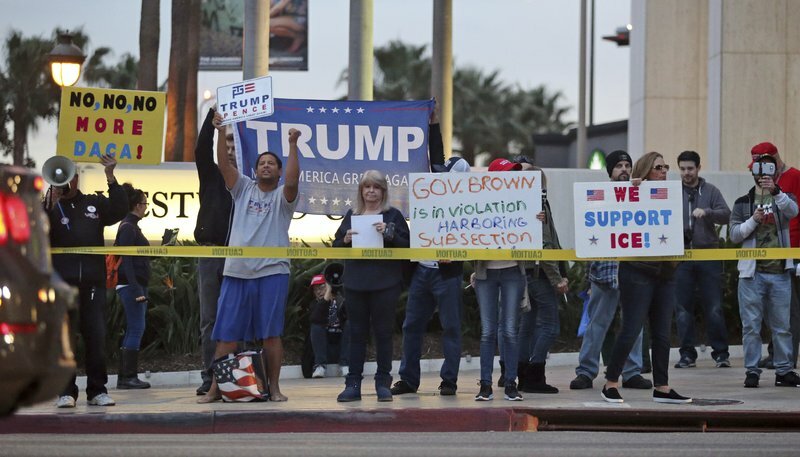 At issue is President Donald Trump’s decision to rescind an Obama-era executive order that created the Deferred Action for Childhood Arrivals program, which gave protected status to about 800,000 immigrants in the United States illegally. Many of these immigrants were brought here as infants or children and have known no other country except the U.S.
Trump gave Congress until March to come up with a legislative solution. Pro-immigrant groups report that an estimated 851 immigrants are losing DACA protections each week as Congress struggles to find a permanent solution. Republicans are resisting a stand-alone bill to provide legal status to the young immigrants unless it includes funding for Trump’s border wall. Liberal groups want Democrats to use what leverage they have to force immigrant protections into government spending legislation that must be passed by Jan. 19 — even if that triggers a government shutdown. Democrats are far from united on whether they should go that far, however. Massachusetts Sen. Elizabeth Warren told The Associated Press on Wednesday that, like many Democrats, she prefers to pass “a clean Dream Act” before Jan. 19. House Minority Leader Nancy Pelosi, in a letter to colleagues this week, reiterated support for a stand-alone bill to protect young immigrants. Pelosi, D-Calif., did not link the issue to the spending bill, even as congressional leaders met with White House officials Wednesday to discuss plans to avoid a government shutdown. Trump planned to meet with Senate Republicans at the White House on Thursday to discuss immigration. A White House spokesman said any DACA legislation must be paired with securing the border with a wall, ending provisions that hamstring enforcement and abolishing a policy that lets immigrants bring a chain of family members to the country. The political director for the progressive group CREDO, Murshed Zaheed, said it was “a pipe dream” to expect the Republican-controlled Congress to adopt a stand-alone bill to protect the young immigrants. That’s why, he said, Democrats must use their limited leverage to include the provision in the must-pass spending bill. Eighteen Democrats in the Senate and 14 in the House voted in favor of a temporary spending bill last month that did not include protections for immigrants. Liberal groups quickly created a website identifying the Democrats as “the Deportation Caucus” and promised to highlight their votes on congressional scorecards ahead of the midterm elections. Warren and several other Democrats with possible presidential aspirations, such as California Sen. Kamala Harris and New Jersey Sen. Cory Booker, voted against the short-term spending bill, while many facing difficult re-elections this fall voted for the package. Seven of 10 Democrats seeking re-election in states where Trump won voted in favor of the spending bill, including Missouri’s Claire McCaskill, North Dakota’s Heidi Heitkamp and Montana’s Jon Tester. Liberal groups largely blame Senate Minority Leader Chuck Schumer of New York for not uniting Democrats behind a hardline strategy, as he did during recent debates on taxes and health care. “This is on Schumer. His most important job is to keep his caucus together,” said Angel Padilla, policy director for the Trump resistance group called Indivisible. More than a dozen Hispanic House members — all Democrats — forced a meeting late last month with Schumer on this issue. Rep. Darren Soto, D-Fla., said Schumer assured Hispanic lawmakers that Democrats “will lay it all on the line” to protect Dreamers. Yet it remains unclear whether Schumer will push his party to risk a government shutdown. Amid that uncertainty, the New York Democrat cast himself among those fighting for the young immigrants on Wednesday. “It’s time that Congress passes DACA protection into law and fix this once and for all,” Schumer declared on the Senate floor. Illustrating the messy politics of the issue, even California Democrat Dianne Feinstein has flip-flopped on the strategy. After initial hesitation, Feinstein voted against the spending bill last month, bowing to weeks of pressure from immigrant groups and her Democratic campaign rival. State Senate leader Kevin de Leon, who is running against Feinstein, has called her “AWOL” on immigration. While some of her colleagues remain undecided, Feinstein appears to have gotten the message. “These young people study, they work, they pay their taxes. They’re patriotic. They’re American in every way that counts, and to leave them in such uncertainty is nothing less than cruel,” Feinstein said. House Minority Leader Nancy Pelosi, in a letter to colleagues this week, reiterated support for a stand-alone bill to protect young immigrants. Um, they are not immigrants. They are illegal aliens who broke our laws to come here illegally. That automatically makes them criminals. Judy, MW, nomas and 1 others like this. PASS THE "CLEAN CHAIN DEPORTATION ACT"
And like all the other Stupid People involved in this insanity, she made an illegal promise she shouldn't have made in the first place and can not keep under the US Constitution. An illegal bill to codify illegal promises to illegal aliens is not and can not be "clean", it's dirty from the outset, on its face. Any amnesty of US immigration law passed by Congress without first repealing the laws they broke violates the 14th Amendment equal protection clause, the uniform naturalization clause and the ex post facto clause of the US Constitution, along with multiple provisions of the US Civil Rights Act of 1964.